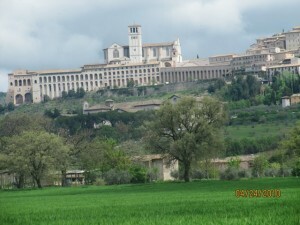 Nearly 800 years ago, Pope Gregory IX, responded to shouts of “Santo Subito” (“Sainthood Now”) when he left the Lateran Palace in Rome and made the 120-mile arduous journey to Assisi (shown at left) to canonize St. Francis. Francis just wanted to be a humble hermit yet died a very public death in 1226, bearing the stigmata and leaving behind an Order and a Rule that bears his name to this day. Not to mention the countless Cathedrals, Basilicas, Churches and Shrines that bear his name. There are many similarities between the impact that St. Francis left on the Catholic Church and the one Blessed John Paul II is leaving. St. Francis bore the wounds of Christ, lived an example of radical poverty, challenged the Church to change and suffered an early death publicly. Blessed John Paul II saw the wounds of a suffering Christ in our culture today, lived an example of love, challenged the Culture of Death in the world and suffered long and publicly. Both men were universally loved in their homelands and elsewhere by the people of their day. Both men were not afraid to challenge both secular and Church leaders when necessary. When St. Francis and Blessed John Paul II died, people demanded that the Church recognize their holiness. Pope Gregory, who was St. Francis’ friend, responded 800 years ago and canonized him in Assisi, less than two years after his death. Pope Benedict XVI, who was Blessed John Paul II’s friend, responded as well and has opened the path to sainthood for his predecessor. Francis went to work, still not quite understanding what God was calling him to do. In the next 20 years he traveled, preached, wrote, built and repaired churches and convents (including one for the future St. Clare) and attracted a following of men and women. His writings today are as relevant as they were 800 years ago. The Rule of St. Francis inspired the establishment of the Franciscan order in 1209. Over the last 800 years hundreds of thousands of men and women (women work in Poor Clare orders) have labored in medicine, mission work, universities and colleges, pastoral and diocesan work all over the world. 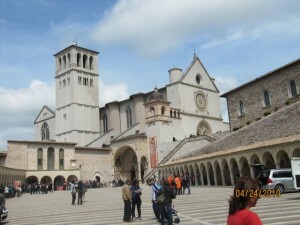 The cornerstone of the Basilica of St. Francis (shown to the right) was laid by Pope Gregory IX himself the day after he canonized St. Francis in Assisi on October 4, 1226. It is worth noting that Pope Gregory and St. Francis had been friends when the Pontiff was Cardinal. He was an early supporter of the radical changes Francis was proposing during the 13th century and became his official protector when the going got tough with some members of the clergy. One last historical note: we “find” that St. Francis record to sainthood was quickly eclipsed in the 13th century. Pope Gregory canonized St. Anthony of Padua, Italy less than a year after St. Anthony’s death. On May 30, 1232 (less than four years after the canonization of St. Francis and in the same geographic area), Pope Gregory inscribed Anthony as a saint. He has been helpful ever since for all of us who have successfully invoked him for our lost objects. Karol Wojtyla took part in the Second Vatican Council, first as an auxiliary Bishop and then as Archbishop of Krakow. He was fully aware that the Council’s decision to devote the last chapter of its Constitution on the Church to Mary meant that the Mother of the Redeemer is held up as an image and model of holiness for every Christian and for the entire Church. This was the theological vision which Blessed John Paul II discovered as a young man and subsequently maintained and deepened throughout his life. A vision which is expressed in the scriptural image of the crucified Christ with Mary, his Mother, at his side. This icon from the Gospel of John (19:25-27) was taken up in the episcopal and later the papal coat-of-arms of Karol Wojtyla: a golden cross with the letter “M” on the lower right and the motto “Totus tuus“, drawn from the well-known words of Saint Louis Marie Grignion de Montfort in which Karol Wojtyla found a guiding light for his life: “Totus tuus ego sum et omnia mea tua sunt. Accipio te in mea omnia. Praebe mihi cor tuum, Maria — I belong entirely to you, and all that I have is yours. I take you for my all. O Mary, give me your heart” (Treatise on True Devotion to the Blessed Virgin, 266). Karol Wojtyla lost his parents, other relatives and friends throughout his early life. Through that suffering the future Pope developed a close personal relationship with Our Blessed Mother. He witnessed deportation of friends who were Jews or fellow Catholics and the future Pope understood, firsthand, the carnage of war. World War II was the most lethal slaughter the planet had ever seen, taking the lives of 72 million people and forever scarring hundreds of millions more. Following that war, as priest, Bishop, Archbishop, Cardinal and then Pope, Blessed John Paul II also saw the rise and fall of atheistic Communism in that same world. The number of dead in the Soviet Union, Communist China and other communist states in the 20th century from outright genocide to forced famines is estimated to be over 100 million. In the latter part of the 20th Century western governments changed cultural thought and society morals that had stood for centuries. These countries, including the United States, passed laws that gave rise to the largest numbers of mass-abortion and contraceptive use in world history. Forty million babies slaughtered in their mothers’ wombs in the United States alone during John Paul II’s pontificate. He and his good spiritual friend Blessed Mother Teresa (not unlike the relationship St. Francis had with St. Clare) would constantly challenge secular leaders in the United States and Western Europe to end the Culture of Death and restore life to the traditional family. He would also challenge world leaders to end armed conflict as means to solve human problems. He spoke for families, traditional marriage and the Culture of Life. Pope John Paul II’s writings, encyclicals, letters and papers, in his time are just as breathtaking as St. Francis’ writings were during his own day and down through the centuries. 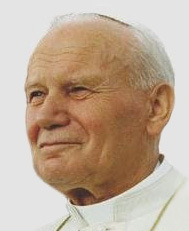 Blessed John Paul II’s greatest legacy, like St. Francis, are the young men and women he spiritually inspired at his World Youth Day events, his over 100 pilgrimages around the world and his ability to speak the world’s languages and dialects when communicating to people. 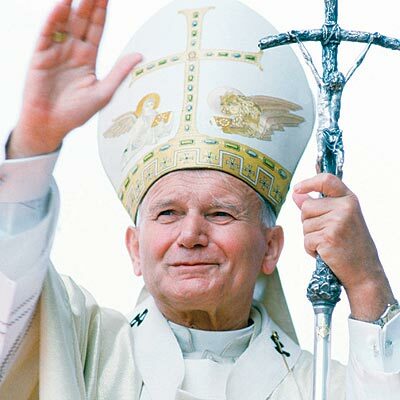 “John Paul II we love you,” was always heard at the events he presided over by those who spoke English. From that small cornerstone that was laid in 1228 the magnificent Basilica of St. Francis of Assisi or Cathedral of Assisi was constructed throughout the 13th Century. Last spring, my newly confirmed daughter Teresa with two of her friends and I were blessed with a few hours in Assisi as part of a trip we took to Italy. 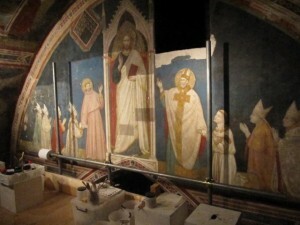 Fortunately, we visited while the final restoration work was taking place, following an earthquake that had struck Assisi in 1997. This gave some visitors, like us, access to portions of the massive Basilica that few have ever seen since its construction over 700 years ago. As we pulled up to park our rental car below the town and outside the walls of Assisi, we found, somewhat amusingly, there was a Blessed John Paul II connection at the Basilica of St. Francis as well. The immense underground parking garage is named after the late Holy Father. We found it rather humorous that such a great Pope had a parking garage at Assisi named after him. We walked from the John Paul II parking garage up beautiful cobblestone streets lined with quaint Italian restaurants and shops selling everything from rosaries to prayer cards to toy figurines of St. Francis before we reached the plaza in front of the Basilica. Knowing our time was short, we quickly decided to purchase a 15-minute guided tour that would take us up the scaffolding to the very top of the inside of the Church steeple to see the restoration work being done on frescoes that dated back to the 13th century. With an hour before that tour began, we went inside the massive Upper Chu rch (the stained glass windows of which you see in this photo) and struck up a conversation with a Franciscan friar who was offering pilgrims free St. Francis’ prayer cards. Brother Sebastian was the youngest of 9 children. He was delighted to know that I had 10 children. Brother Sebastian’s English was good enough to ask him about the “Lady of Guadalupe” picture he had behind him. He told me about his devotion to the Blessed Mother and the story of Guadalupe he had learned from Pope John Paul II because of the Holy Father’s very first pilgrimage there. So here was another connection, a Franciscan friar being inspired, in part, to take on the Franciscan robe because of Pope John Paul II’s devotion to Our Lady of Guadalupe. Incidentally, the Basilica of Our Lady of Guadalupe is the only place, outside of Italy, that, as Pope, John Paul II visited four times. 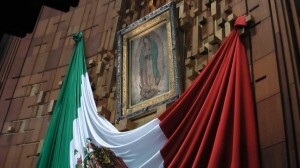 There is a huge 40-foot statute of him on the grounds there in Mexico City between the old Basilica and the one dedicated to hold the nearly 500-year old image of Our Blessed Mother given to St. Juan Diego. I stood in front of it to take this picture of the Tilma. Seeing this image of Mary put an end to human sacrifice in the Aztec culture and converted nine million Aztecs to Catholicism in nine years during the 15th century. It is why Mexico, Central and South America are predominantly Catholic today. When our time arrived to climb the scaffolding inside the steeple to see the frescoes up close, it was amazing to see first-hand the details of the work we were looking at as we ascended the 7 levels of scaffolds. Our tour guide informed us that one of the last great painters in the Byzantine tradition, Cimabue, worked here in near seclusion to create these frescoes (photo at right). 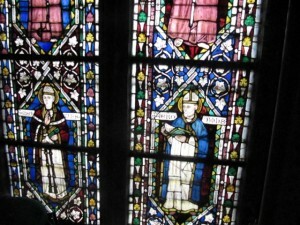 Until this restoration work was done, no-one had been able to see these works at all, for over 700 years. From the bottom of the church floor to the top reaches of the ceiling, where we were standing, minute details in these frescoes, created with deep spiritual symbolism and meaning, could only be seen by those who created it, or as our guide said, “the eyes of God or the angels themselves”. 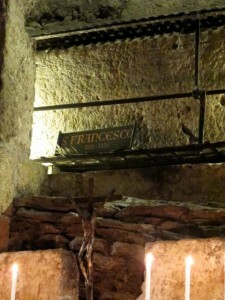 Climbing down, we entered underneath the Basilica to see the tomb of St. Francis in the Lower Crypt. Just last month (April, 2011) the restoration work in this Lower Crypt was completed with the cleaning of the quartz stone from the hundreds of years of soot from the candles that have been lit and left by pilgrims who have said prayers before the remains of St. Francis. Incidentally, when St. Francis died he wanted to be buried anonymously in the cemetery that was reserved for executed criminals, so that it is where the Basilica was built. Just before St. Francis died on October 3, 1226, he removed his ragged brown cloak and borrowed a friend’s robe to wear. He wanted to leave the earth honoring his vow of poverty and truly having no possessions. St. Francis, after seeing the vision of the Passion, wanted to live his life as a hermit, believing his private, humble prayers would be enough. Blessed John Paul II initially wanted to be an actor, believing, in part, that winning people’s hearts through laughter and entertainment was what God intended for him. He developed a “theological vision” and trusted that the Blessed Mother would guide his country out of the darkness of Communism and into the light of Salvation. Both men always accepted the will of God for them and spent long hours in personal prayer. Francis eventually received the five wounds of Christ, which became the testament to his sacred life when his body was taken through the streets of Assisi the day after he died. Even the future St. Clare and the throngs gathered for the procession of his body saw the sacred bloody wounds as the body of St. Francis was initially laid to rest at St. George’s in Assisi the day after he died in 1226. The cries of the people of “Santo Subito” were heard by his friend Pope Gregory IX in Rome. The world watched as the late great Pope John Paul II publicly and gracefully suffered community martyrdom as he bore a debilitating disease that ravaged his frail body. When he died millions in Rome, and over a billion around the world, mourned his passing and their cries of “Santo Subito” were heard by his friend Pope Benedict XVI. When he was beatified on Divine Mercy Sunday, a crowd of over 1.5 million came from all over the world to witness the Mass at St. Peter’s. Blessed John Paul II’s body was laid to rest in a spot where Blessed Innocent XI (1676-1689) incorrupt remains were relocated from the interior of St. Peter’s. Visitors now at St. Peter’s will pass by arguably the most famous sculpture in the world, Michelangelo’s The Pietà, before they now see the casket of Blessed John Paul II. St. Francis’ place in Church history is already assured and known. How the world will view Blessed John Paul II in 800 years remains to be seen. While there were issues and problems during the pontificate of Blessed John Paul II, we know that Church membership flourished globally, nearly doubling to 1.2 billion souls from 1978 to 2005. The number of young priests and religious in the world today that were inspired — like Brother Sebastian I met in Assisi — to join orders because of Pope John Paul II is countless and will continue to grow in the future. Blessed John Paul II, like St. Francis, left us deep spiritual words to ponder for centuries to come. The late Blessed John Paul the Great taught us the truth about our place in this world and the Heavenly One to come and, most importantly, what it means to love one another in the name of Christ. His simple words, “Do not be afraid” give us comfort in times of trial and suffering. Those same simple words are also the spark to light the imagination of the possible. John Paul II is indeed Blessed today; Santo subito, domani!